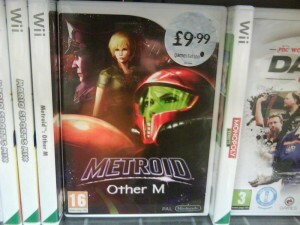 It’s amazing how far Metroid: Other M has fallen. Okay, not that amazing, since the series has been consistently underperforming since its debut in 1986. While it started out with poor reviews and poor sales, the game recently hit a new low: it’s now selling for the extremely-low price of £9.99 at GameStation in the UK. How can one of last year’s highest-profile Nintendo releases have already essentially made its way into the bargain bins? The answer’s deceptively simple: the game doesn’t fit Nintendo’s philosophy. It’s clear from the big-budget voice-acted cutscenes, the glaring holes in the story, and the massive focus on Samus’s character that the game was developed with a story-first, gameplay-second mentality – exactly the opposite of Nintendo’s trademark approach. Whether you liked the story or not, it’s plain to see that it overshadowed the gameplay a bit too much to be tasteful, and the shift obviously didn’t go over well with fans. If there’s anything we should learn from Other M, it’s that we should be careful what we wish for in terms of story. Sure, it’s nice when a game comes along with a well-crafted plot and interesting characters, but when these elements become the primary focus the result is more like a bad movie than a blockbuster title we’ll play over and over again until our fingers bleed. Even if Other M‘s story hadn’t gone over so badly, the overabundance of cutscenes and scripted action versus good old classic gameplay probably still would have held it back. I can testify to this, as I loved both the story and gameplay but still realize that the game missed out on its full potential by a longshot. Next time, let’s make Metroid the right way, shall we? Then maybe it’ll be relevant again.